Researchers have been curious about how the availability of nonemployer-tied medical insurance offered through health care reform would affect retirement. If new options, such as subsidized nongroup policies and expanded Medicaid coverage, led to shorter work lives, it could undermine public policies developed to encourage later retirement. So says their model. But has health care reform encouraged workers to retire? Two other recent MRRC projects found that it hasn’t — at least, not yet. Alan Gustman, Thomas Steinmeier, and Nahid Tabatabai used HRS data to look at whether early retirements and subsequent Social Security claiming were being affected by the presence of health insurance in their 2016 MRRC project (http://projects.isr.umich.edu/mrrc-archive/publications/papers/pdf/wp343.pdf). 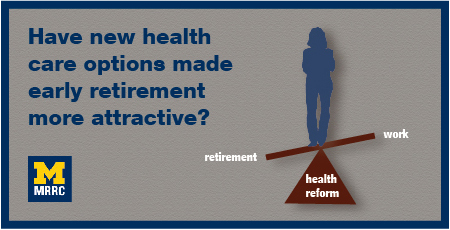 The authors found that, for those with health insurance at work but not in retirement, health care reform did not change retirement expectations or increase retirements during the period 2010 to 2014. The trio’s model did suggest that reform eventually—within a few years if the law remains the same—will increase retirement probability for workers with insurance at work, but not in retirement. In their 2015 MRRC working paper, “The Effect of Health Reform on Retirement,” Helen Levy, Thomas C. Buchmueller, and Sayeh Nikpay also found little evidence that newly available coverage has affected retirement. Using data from the basic monthly Current Population Survey from January 2005 through June 2015, they found no evidence of an increase in retirement or a shift to part-time work among older workers during the first 18 months in which the reform’s new alternatives to employer-sponsored coverage were widely available. The authors pointed out that several factors may have inhibited take up of newly available coverage, including initial technical difficulties with the online marketplace, significant legal challenges resulting in the U.S. Supreme Court case “King v. Burwell,” and general unfamiliarity with new options. While reform has not increased the number of early retirees, it has meant that fewer of those who do retire early go without coverage. Levy, Buchmueller, and Nikpay’s 2016 working paper, “Health Reform and Health Insurance Coverage of Early Retirees,” used data from the U.S. Census Bureau’s American Community Survey (ACS) for 2008 through 2014 to examine how the reforms affected health insurance coverage for early retirees. The authors found that the fraction of early retirees without coverage declined from 14.7 to 11.2 percent between 2013 and 2014, “reversing a trend toward increasing uninsurance in recent years.” The gains were particularly large among those with very low-income in states that expanded Medicaid. On an individual level, leaving the workforce before full retirement age, impacts a retiree’s financial security because their monthly Social Security benefit is less. On a national level, more people retiring and claiming benefits early could affect the Social Security trust fund balance. There is some evidence that instead of a full-stop retirement, more older workers are moving to “bridge” jobs, replacing stressful, full-time employment with more flexible, part-time positions. Whether or not health care reform plays a role in that has yet to be determined.